We updated our homepage recently to give a better snapshot of the creative nature of our company. Of course we design and produce custom wallpaper, but we also produce custom event decor as well. We do a lot of bar and bat mitzvah celebrations and themed corporate events, but lately we've been contributing decor pieces for weddings. Most importantly, our work was recognized and included in TNT's first reality show, "Wedding Day." The premise of the show is to give deserving couples who have overcome adversity the wedding of their dreams. A great concept that was executed brilliantly by Mark Burnett Productions, who've produced numerous successful programs including "Survivor." The happy couple we helped decorate for was right here in Detroit, and they were given an unbelievable Celtic inspired wedding, complete with a replica of a Celtic church in the Westin Book Cadillac's grand ballroom, complete with pews, faux stone walls, and faux stained glass panels which we designed and helped produce. We also produced an image of the Celtic Tree of Life as a floor graphic to adorn the dance floor, as well as table runners featuring artwork by the bride's young students. The show airs July 18th 2009 at 9:00 AM EST on TNT. The image displayed above is not from the wedding, but was from a party that we decorated for an art auction house. They wanted to use custom backdrops to create a turn of the century Paris feel. We accomplished this with photography, as well as trompe l'oil elements to create the facades, windows, and statues. 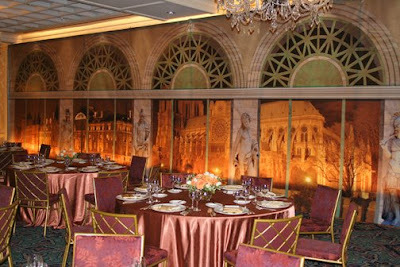 Similar techniques that we employ for custom wallpaper installations, but on backdrops that go up and come down in a single day. Check our our event decor website for more examples of our backdrop work, and tune in to TNT to watch our national television premier!